The beautiful art we've seen from him definitely confirms everything that he said in the video. It stays true to what we all know while giving it a cool new edge. I think fans can be confident in the work he is putting into Mega Man 11. Interesting commentary, but I also found his digital drawing tools very interesting. Anyone know what software and/or input devices he was using? I like the new look. It suits this version or Mega well. I find it fascinating that while the art style has changed over the years, the basic character design hasn’t (like with Adol from the Ys series). He's still a blue-eyed Astro Boyish robot with a cool helmet. Absolutely love his art design, I think he's nailing it. Am i the only one who never fails to get feels from the Mega Man 8 credits theme? I can't put my finger on it, but that specifically 90's smooth sax combined with piano and synthy, airy sounds inspires some serious nostalgia in me. The Mega Man 8 Credits Theme is actually one of my favorite pieces Mega Man music ever. I could listen to it all day. Too bad there isn't more music of that style in other Mega Man games. Which reminds me, I should listen to more of Shusaku Uchiyama's work and see if he's composed anything else this awesomely chill. I really enjoyed his analyse and breakdown of Mega Man and his different look. He's a fan just like us. Though I'm not really a fan of the Legends series, his new Mega Man is amazing to me. I love the stubby Mega Man that was in Smash Bros. because it looks more like the Mega Man that I grew up with in the early games, but still love the more updated Mega Man 8 style design. The more news that comes out the more excited I am for this game. 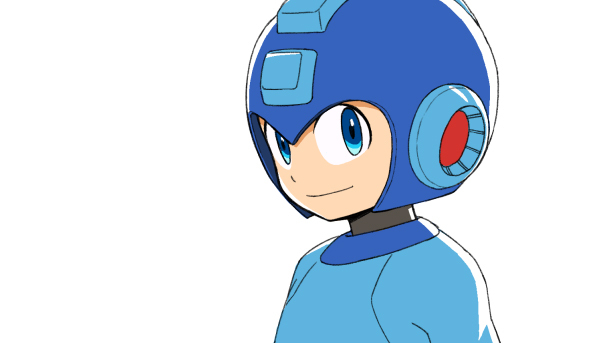 Thank the gods that we are finally getting a new Mega Man. I hope it lives up to my excitement for it. Definitely, I love the new megaman look, he is looking cool and still is the same megaman that all we know, I fall in love. I think it was a good idea to base his look off of the official art and sources like that. It helps give it a modern appearance while still being recognizable as the character that is recognized as an icon. That and because there are a number of sources they can look at for his appearance, this new design doesn't stop them from doing more stylized games like Powered Up again, if they so choose.